Results: skin flaws are limited, clogged pores are unblocked and excess sebum is regulated. *Test de satisfaction réalisé sur 24 femmes ayant reçu un soin unique. 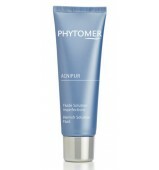 This ACNIPUR treatment is the purifying solution for thick and oily skin with blemishes, regardless of your age. Used alone or as a cure of three treatments, ACNIPUR Blemish Solution Treatment cleans your skin in-depth, leaves it matte and, thanks to its astringent effect, evens out your complexion. *Satisfaction test conducted on 24 volunteers who received a single treatment. ** Scoring performed by a dermatologist on 24 women - average result obtained after a single treatment. This purifying serum is the essential product after blackhead extraction that delivers the skin its soothing, purifying and matifying effectiveness. A deep-cleansing program with proven effectiveness against blemishes for visibly healthier-looking, clearer skin and a complexion that regains all of its freshness.